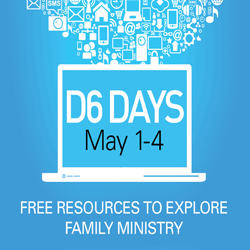 I love what the D6 Conference guys do around this time every year: they take some of their best family ministry training sessions from last year’s conference and make it available to you for free. As someone who’s attended the D6 Conference for the past several years, I’m not only encouraged by the family conversation that’s taking place, but also by the heart of those behind D6. They’re truly serving ministries the best way they can to help facilitate a conversation around family ministry that influences the trajectory of how we reach and serve people. Below is a list of sessions you can watch and listen to for free for the next 4 days, May 1-4, at D6Days.com. On Sunday, this all goes away. If you only have time to watch one of these, I highly suggest watching Rob Rienow’s sessions called, “A Church Philosophy for the Generations.” In it he walks through many passages about how scripture says we are to pass faith to the next generation. I probably took more notes during that session than any of the others. In fact, I think I ended up writing down almost everything he said! It’s been 6 months since I heard him give this talk at the D6 Conference and I’m still processing it. Definitely watch it, but do it soon because on Sunday D6 Days is over. Watch and listen to these sessions at D6Days.com until Sunday, May 4, 2014. FREE videos and mp3 recordings from the D6 Conference!